Hot Bananas is the name of a group of joyful souls that get together every Wednesday evening just for the sheer pleasure of singing! 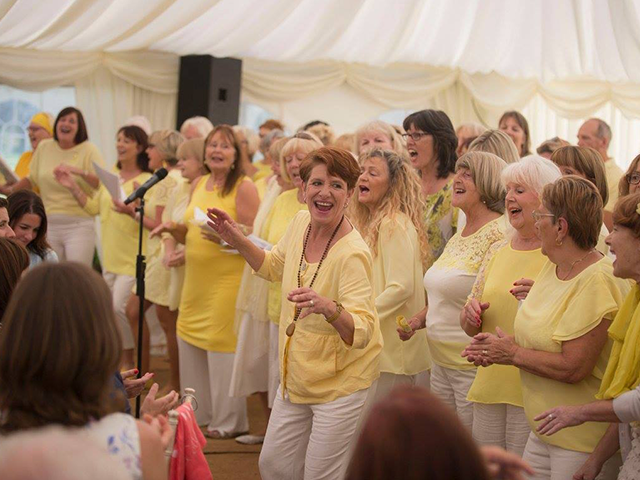 The ethos of the Hot Bananas is that the success of the group is measured on the amount of laughter that goes on during a practice session, and the rate of the ‘high’ they take home with them after an evening of singing together. The Hot Bananas started ‘just for fun’ in 2011 with just 15 people who all enjoyed singing but didn’t want the pressure of conforming to a ‘serious’ choir or choral group. They wanted the emphasis to be on having fun, forgetting about being ‘good enough’ or technically ‘right’ and just allowing their voices to soar free without self-consciousness or the pressure of being judged. As an amateur group, no thought was given to performing for the public but here they are, almost 7 years later and with now over 100 Hot Bananas making up the total group, regularly being invited to perform at various events throughout the island – usually in support of various local charities, and they relish doing so. Hot Bananas are this year supporting ‘Brightly’ (formerly known as Brig-y-Don) –a charity that supports vulnerable children and young people in Jersey.